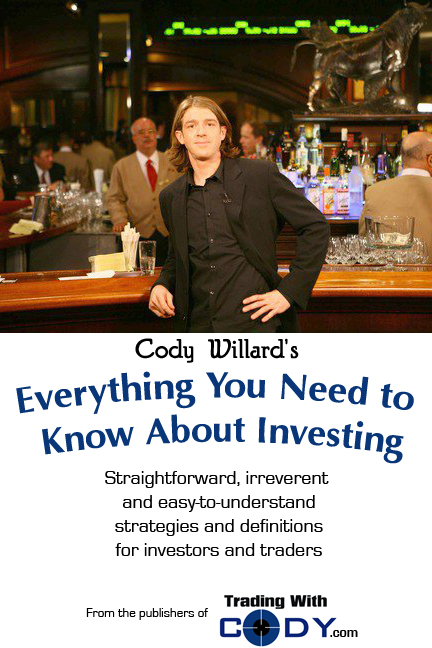 You have four options for getting your hands on Cody Willard’s Everything You Need to Know About Investing book. Click here to get TradingwithCody.com for $99 a month and get a complimentary signed paperback copy of Cody Willard’s Everything You Need to Know About Investing PLUS seven more investment eBooks from Cody PLUS access to Cody’s trades as he’s making them in real-time. Click here to buy the paperback version on Amazon.com for $14.99. Click here to buy the kindle version from Amazon for $9.99. Click here to get the PDF version for $9.99. In 1996 I came to New York City with a degree in economics from the University of New Mexico, a suitcase, a guitar and just about nothing else. I dreamed of becoming a “Wall Street Rock Star,” so while I was searching for a way to get my foot in the door anywhere I could, I devoured every book on trading, stocks, investing, options, brokering, and economics. None of them really delivered the hard truths along with the information and knowledge base that every investor and trader needs to know. In the years since, I became the first ever partner of a legendary stock broker and analyst by the name of Andrew Lanyi. I ran the research division at a venture capital tech fund. I ran the wholesale division of a major telecom company. I wrote a technology newsletter for TheStreet.com and a long-time investment column for the Financial Times. I launched a successful hedge fund at the exact bottom of the Nasdaq in October 2002. I closed said hedge fund at nearly the exact top in October 2007 when I become an anchor of my own primetime news show out of the Waldorf-Astoria’s famed Bull & Bear Bar which became Fox Business’ most popular show for a long time. I signed a deal to become the first ever Wall Street correspondent for The Tonight Show. And I packed up and lately have been successfully investing and trading my own money from my dream ranch back in my hometown in rural New Mexico. But it’s not like it has been all sunshine and profits. Far from it. Let me be clear that during those same years that sound so glamorous when stated as above, I also nearly starved while trying to write a novel that nobody wanted to publish, much less read. I lived with cockroaches and rats in tiny rented apartments near Harlem, in Borough Park, and in the Parade Grounds in Brooklyn. I lost everything on 9/11. I had a more than 50% drawdown and was down 40% at one point on the year while I ran that hedge fund. I vomited almost every morning while I ran other people’s money. I was mocked for how small my hedge fund was by Maria Bartiromo on national TV. I got Bell’s Palsy — which onset during a live broadcast of one of my own TV shows on Fox caused by Lyme Disease (now cured) while I didn’t have health insurance. And I made so many stupid mistakes that I can’t even remember them all. And that’s why I wrote this book. I’ve been around the Wall Street block for a long time, and I’ve seen firsthand the best of the best and the worst of the worst. I’ve worked with people who have made billions, and I’ve also seen people lose billions. I have interviewed hundreds of CEOs, Senators, Congressmen, celebrities. And most importantly, I’ve also spoken to tens of thousands of everyday people from all walks of life about how they manage their money, and I’ve helped them get a handle on what they’re doing. I’ve made a lot of money for a lot of people, although like anybody else, there have been other times I’ve lost money. For this book, I’ve drawn upon everything I’ve learned over the years. 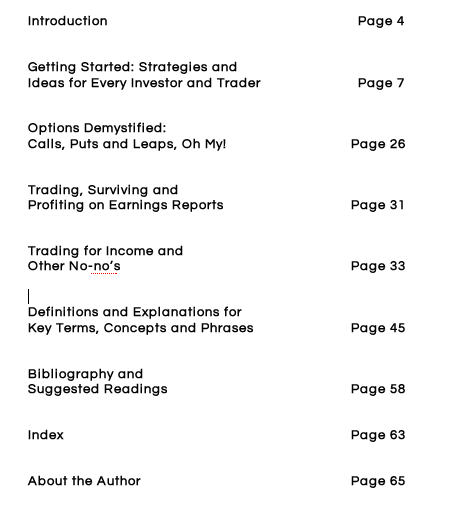 I’ve tried to cover every topic in a way that will be helpful for the average Joe, but I guarantee that every investor and trader, no matter how experienced and successful, will find a lot of gems in here too. We’ve presented the information in a Q&A format that I hope makes the content accessible and enjoyable. There’s also a glossary of key terms, concepts and phrases and a helpful bibliography of suggested further reading for those of you who want to dig deeper. You can never be too educated when it comes to your money. A couple things not to expect in this book — a magic silver bullet or immediate short-term gains in your portfolio. This book is to help you make big money and protect your capital over the next 10,000 days, not the next 100 days. The key is to get more investments and trades right than wrong over our entire investment/trading career and to maximize our gains in those we get right while minimizing our losses in the trades and investments we get wrong. I’ve been high-profile trading and investing successfully for a very long time now and while I’ve got no magic bullet for you, I am quite confident you will become a better investor and trader by reading and following the lessons offered in this book.